I've been quilling recently. Unlike scrapbooking or kids crafts that I do fairly consistently throughout the year, I tend to do a couple of quilling projects all at once, then ignore it for a year or so. I'm hoping to work on it more regularly, because I really do enjoy it. 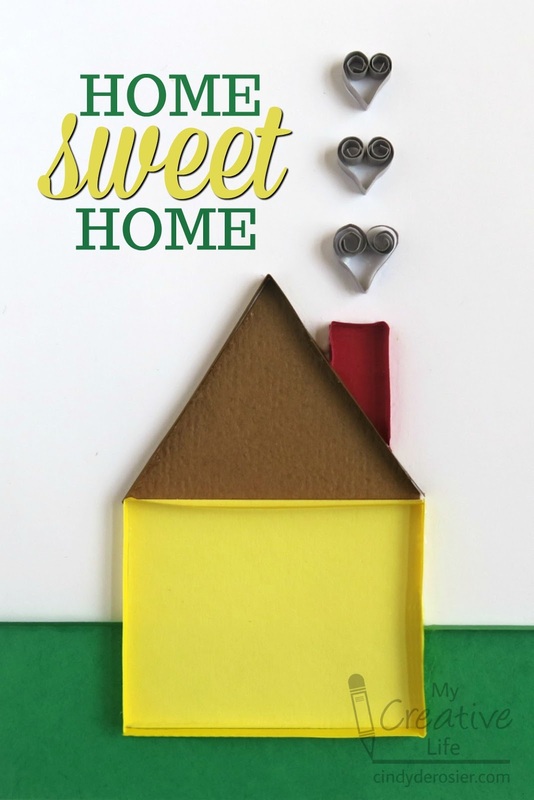 My latest project is this Home Sweet Home card. There are affiliate links throughout this post. I earn a small commission on any purchases you make after clicking a link, at no extra cost to you. Cut a piece of white cardstock to make a card base. If you want your card to have a printed, stamped, or hand-written sentiment on it, like my example above, do that now. Otherwise, your finished card will look like this. 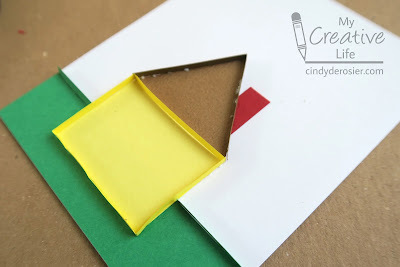 Glue a rectangle of green along the bottom of the cardstock to make the grass. Add a yellow house with a brown roof and brick red chimney. 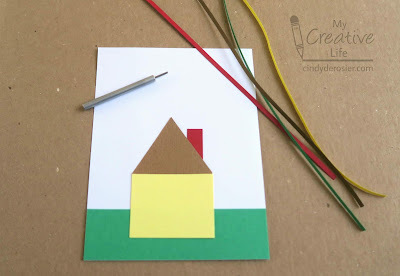 Place a piece of yellow quilling paper next to the right side of the house. Make a fold where the side of the house meets the base of the house. Move the paper along the base and make a fold where the base meets the left side of the house. Continue until you have folded the yellow paper three times and it perfectly surrounds the house. Snip the excess paper. Put a thin line of glue just along the edges of the yellow cardstock and lay the quilling paper on end around it. Cut two small strips of green quilling paper so that they fit on either side of the house. Glue them in place. Fold a piece of brown quilling paper and trim it to form the roof. 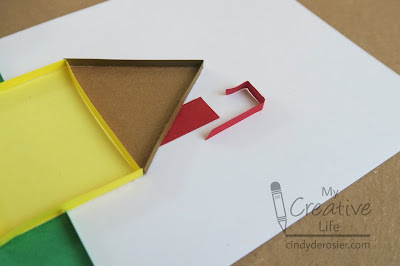 You do not need the third side to the triangle, since there is already a piece of yellow quilling paper there. Glue it in place. It is important that the glue you use dries clear. As you can see below, a small amount of glue is showing after I glued down the roof. At this point, I used the toothpick to clear away the excess glue as best I could. It dries clear and you'll never notice it if there's just a small amount. Fold a piece of red quilling paper to form the chimney. Again, you don't need the fourth side, since it's already there in brown. Finally, use the quilling tool to make three grey hearts, each slightly smaller than the previous. Do this by folding a small piece of grey quilling paper in half, then using the tool to roll each side in toward the center. Pinch the bottom of the paper and you have a heart. Glue the three hearts to make the smoke coming from the chimney. Obviously, you can change out the colors and proportions of the house to match the recipient's house. Put the card on a blue background if you wish, or paint a sunset for the background and do all the quilling in silhouette. There are so many possibilities. This looks amazing! LOVING the hearts!!!!! !